Helical loading, by winding the radiator into the form of a linear spiral. My really short 20 mtr dipole (2x 0.7 m, 2x2.3 ft !!!) ) that can easily be installed vertically is described here. In May of 2008, I dug up my my 20 meter mid-loaded short dipole from a dark corner of my "antenna cemetery". This time I installed in a vertical position. Note that each of the two fishing poles that make up the arms of the dipole, is almost 3 meters long. I used a 3 m section of 40 mm (1.5") diameter PVC pipe from the Do-It-Yourself store as a mast. The base of a large room fan served as a temporary stand. July 2008. Just for the fun of it, I did some experiments with half of the 2x3 m dipole describe above. 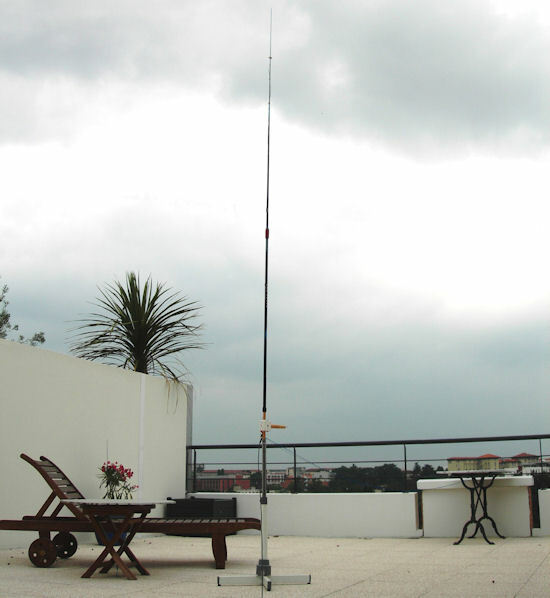 I installed it as a 3 m monopole, about 1 meter off the ground. As a single radial, I used 3½ m (11.5 ft) of installation wire - just because I had it handy. The radial runs horizontally from the base of the antenna. Basically an L-antenna configuration (ref. 7, 8). Tunes/loads easily. Marc, DL5NA, gave me an SSTV RSV of 585. Some stations come in slight weaker than with my Cobra dipole, others same strength. Below is the plot from my miniVNA antenna analyzer (antenna + coax + choke balun). The resonance peak has moved up a couple of 100 kHz with respect to the mini-dipole. More to experiment with! 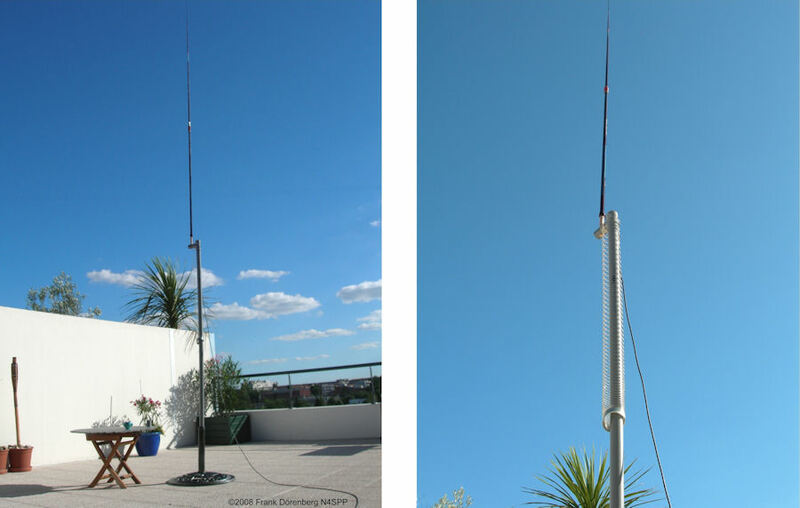 20 MTR VERTICAL 3 MTR (10 FT) MONOPOLE WITH SLINKY® COIL "COUNTERPOISE"
14-July-08. I changed the antenna configuration again - just for fun and out of curiosity. 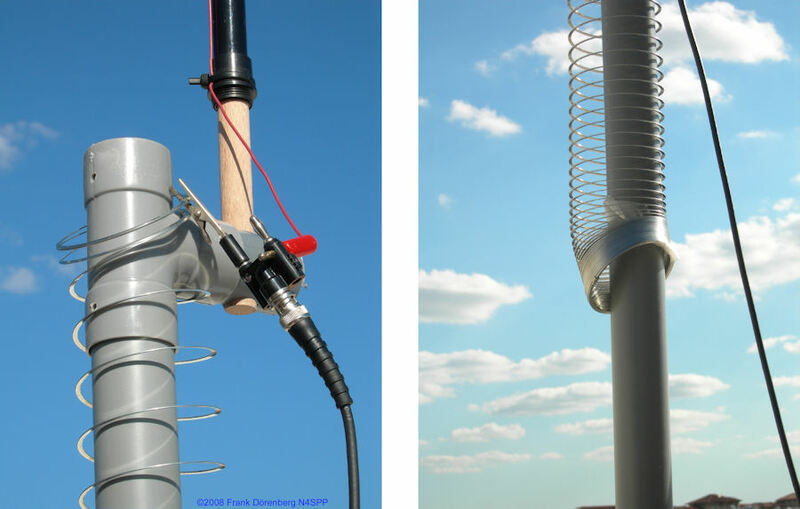 This antenna is simply the top half of the center-loaded vertical mini-dipole shown above, but this time loaded with a Slinky® coil counterpoise below it. First I tried to tune the antenna by shorting-out a number of windings at the bottom of the Slinky coil. Managed to tune from 8-12 MHz and above 15 MHz, but not in the 20 meter band!? Gave up on that, and tried to tune simply by raising and lowering the bottom of the Slinky coil. With a free-hanging Slinky coil, the resonance frequency was about 12320 kHz, resistance very close to 50 ohm, and an SWR of 1.2. 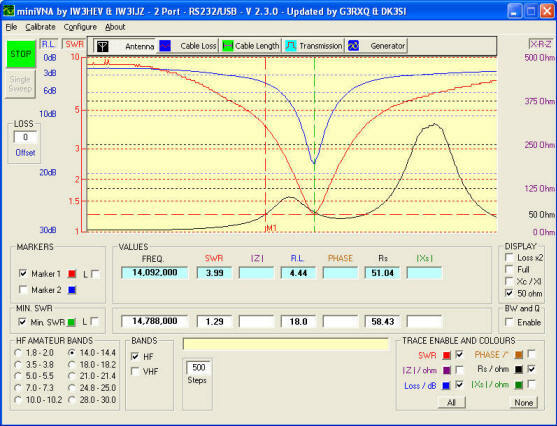 See the he antenna analyzer plot below (left). Not bad, just the wrong frequency, hi! Raising the bottom of the coil to 90 cm (35") below the top of the coil did the trick: tuned close to the SSTV calling frequency (14230 kHz), SWR of 1.4, and a bandwidth of about 400 kHz between the SWR=2 frequencies. Just taped the bottom of the coil to the PVC mast. Obviously when the wind moves the coil, the SWR moves around a bit (1.2-1.5). For my Slinky coil dipole, see this page. Ref. 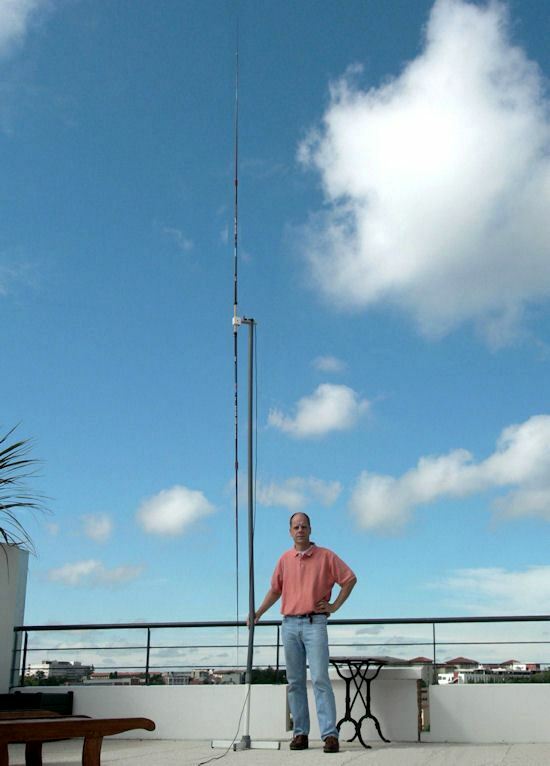 10A: "An experimental look at ground systems for HF verticals", Rudy Severns (N6LF), in "QST", March 2010, pp. 30-33.